CHEK2 is a tumor suppressor gene whose functions are central to the induction of cell cycle arrest and apoptosis following DNA damage. Mutations in CHEK2 have been associated with cancers at many sites, including breast and prostate cancers, but the relationship between CHEK2 and gastric cancer has not been extensively studied. In Poland, there are four known founder alleles of CHEK2; three alleles are protein truncating (1100delC, IVS2G>A, del5395) and the other is a missense variant (I157T). 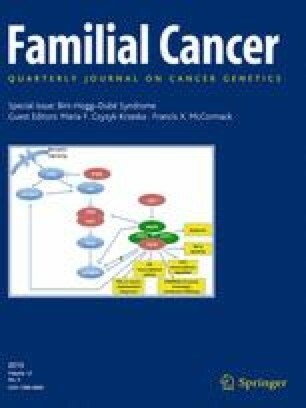 We examined the frequencies of four Polish founder mutations in the CHEK2 gene in 658 unselected gastric cancer patients, in 154 familial gastric cancer patients and in 8,302 controls. A CHEK2 mutation was seen in 57 of 658 (8.7 %) unselected patients with gastric cancer compared to 480 of 8,302 (5.8 %) controls (OR 1.6, p = 0.004). A CHEK2 mutation was present in 19 of 154 (12.3 %) familial cases (OR = 2.3, p = 0.001). The odds ratio for early onset (<50 years) gastric cancer was higher (2.1, p = 0.01), than for cases diagnosed at age of 50 or above (OR 1.4, p = 0.05). Truncating mutations of CHEK2 were associated with higher risk (OR = 2.1, p = 0.02) than the missense mutation I157T (OR = 1.4, p = 0.04). CHEK2 mutations predispose to gastric cancer, in particular to young-onset cases.